A beautiful 18ct white gold ring featuring a round cut diamond surrounded by a twisted halo and diamond set shoulders, totalling 1/2ct. Handcrafted by leading diamond cutter Leo Schachter, the Leo Diamond is cut to reflect light like no other diamond. 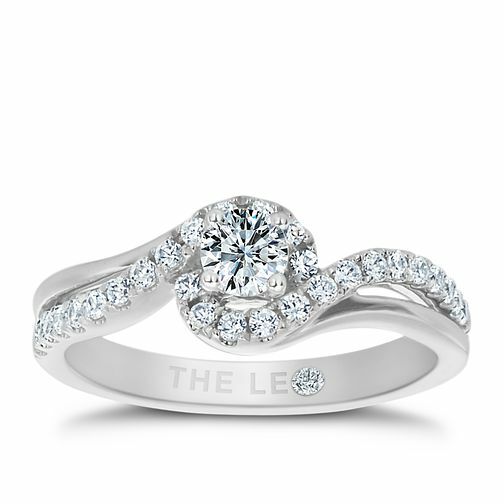 Leo Diamond 18ct White Gold 1/2ct II1 Diamond Halo Ring is rated 5.0 out of 5 by 1. Rated 5 out of 5 by Anonymous from Beautiful and sparkly diamonds. I bought it to treat myself. It feels comfortable and strong.